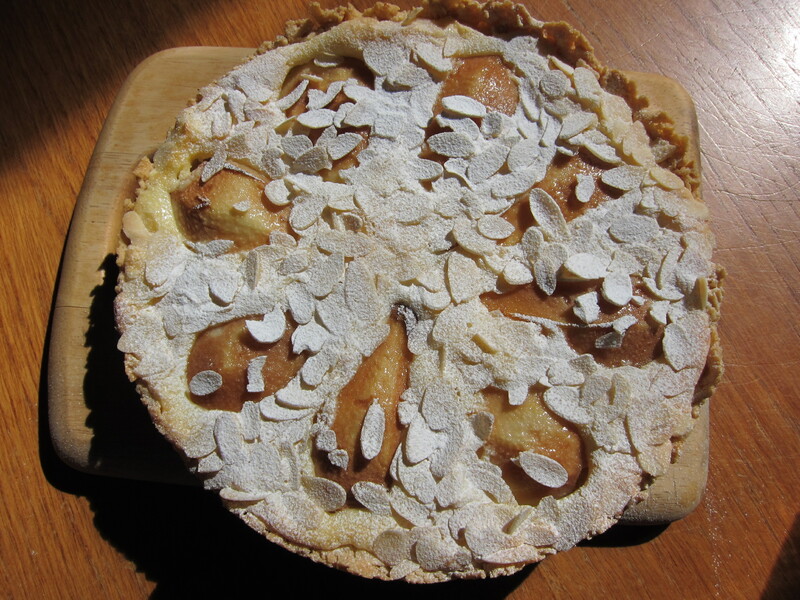 Recent sunshine gave me not only much needed energy but also inspiration to bake something…sunny.. And I couldn’t think of anything else that reminds me of the sun rather than this lovely sweet-scented tart with its silky filling, that tastes delicious when slightly chilled. It also works best if the pears are on the overripe side so that that are fork-tender when cooked. To make the pastry, mix the flour and sugar, add the butter and 1-2 tablespoon of cold water, mix until mixture resembles coarse breadcrumbs and starts to gather in lumps, briefly knead to form a ball. Wrap in cling film and chill for 1 hour, until firm. Coarsely grate the chilled pastry into a large bowl. Using lightly floured hands, scatter the grated party into the prepared tin and use your fingers to gently press it until the entree base and side of the tin are covered. Bake in preheated oven for about 25 minutes, until lightly golden. Let cool. Meanwhile, peel, halve and core the pears. Pour the lemon juice over them and sprinkle with 1 tablespoon of sugar. In separate bowl mix well 4 tablespoons of sugar with mascarpone, eggs and flour, until it’s a thick paste. Spread the mixture over the pastry. Arrange the pears on top and scatter with the almonds and granulated sugar. Bake in the still-hot oven for 40-45 minutes, until the pears are soft and the mascarpone mixture has set. I found this cake are best eaten at the same day, with cream or vanilla ice cream on the side.